Garmin has bombarded us with fitness trackers and running watches this year, but the Garmin Vivomove HR might be the most exciting of the lot. The first Vivomove was essentially a fitness tracker in traditional watch form, but the Vivomove HR is a full hybrid of style and smarts, layering features like notifications on top of better fitness tracking and a heart rate sensor. Most intriguing of all is the hidden display. The Vivomove HR gives nothing away when idle, but on the lower half of the face is a display that illuminates with notifications and menus; Garmin's baked an entire operating system into its new watch. Can Garmin strike a good balance between those two worlds? We've been living with the Vivomove HR to find out whether this is the hybrid to beat. Here's our comprehensive verdict. 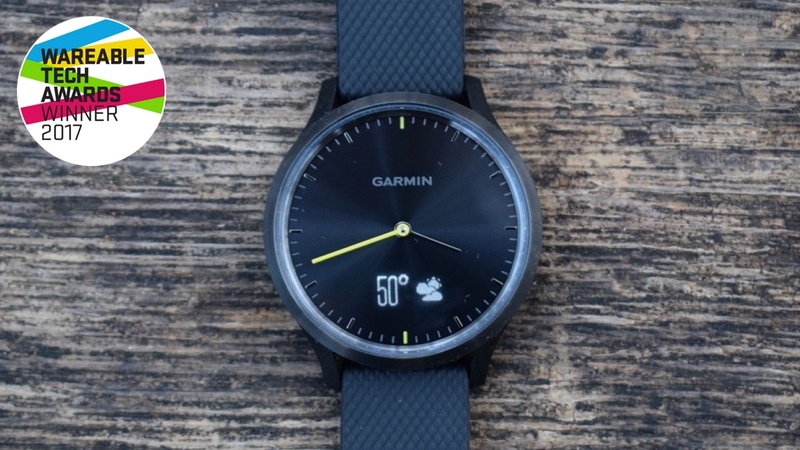 Garmin has a lot of strengths, but design has never been one of them. With the first Vivomove a rare exception, Garmin's sports watches and trackers have relied on rich workout features to carry them without much of an eye for style. So yes the bar is a little lower here, but the Garmin Vivomove HR really is a nice looking watch, a hybrid that fully conceals its smart identity in an attractive timepiece you won't mind being seen with. Which brings me to the device's most interesting idea: the display. A quick glance at the watch and you wouldn't think it's there, but raise a wrist or tap on the lower half of the watch face and that touch-sensitive display will light up, showing you information on everything from the date to the weather to your day's calorie burn. When you're reading the screen, the clock hands move to ten-t0-two to keep them from obstructing your view. Still, I've found that display becomes almost totally unreadable when under sunlight. You can adjust the brightness in the watch's settings, but the problem seems to lie in the glare from the glass rather than the display itself. On a few occasions I've found myself having to awkwardly angle my wrist to see if a vibration meant I'd received a new message or whether it was just another move reminder. The time itself is still visible, so it's not exactly an earth-shattering problem, but it's not ideal either. Garmin's hybrid walks that tricky line between a fully-functioning smartwatch and a nice timepiece, and can claim to be only the second hybrid to include a heart rate sensor (the Nokia Steel HR was the first). There are no buttons on this watch as all interactions are done through the screen: swiping left and right will scroll through the different faces, and some you'll be able to tap on to show more information. The operating system is almost identical to the one you'll find on the Vivosport and Vivosmart 3, so if you've used those trackers then you'll be familiar with the interactions, except you're swiping across just the bottom of the watch face here. Having a display opens up the ability to read messages on the screen, and like other Garmin wearables the Vivomove HR supports every notification coming through your phone. Annoyingly you can't filter these, so you can only choose to have them all off, all on, or so that you're only alerted when a phone call is coming through. Alerts will pop up with the name of the app, which you then tap to open, but for some, like Facebook Messenger, you'll just see a speech bubble. As we know all too well here at Wareable, notifications on hybrids are never perfect, and in the case of the Vivomove HR it just can't fit enough on the display at one time to make these anywhere near as good as they are on the Samsung Gear Sport or Apple Watch Series 3. While you can scroll through the entirety of each message that comes through, the Vivomove HR can squeeze so little on the screen at one time that it's often going to be faster to just reach for your phone. It's good for calls and urgent notifications, but otherwise it's not the best medium for reading messages. It's the same issue that we've seen on Garmin's fitness trackers, and sadly the Vivomove HR doesn't give you any more space for messages to live in. Some smart features, like the music playback control, I've found more useful. The Vivomove HR doesn't have any onboard storage so you won't be able to load on any songs, but you can control what's playing from your paired phone. Garmin's also taken advantage of its heart rate sensor to include some better wellness features, including stress tracking, which it introduced in the Vivosmart 3 earlier this year. This works by tracking heart rate variability and giving you a score – of 0 to 100 – of how stressed you are. And then of course you have your step tracking, calories burned, flights of stairs climbed and current heart rate – all of which you can view by swiping along that little screen. If you're big on the outdoors, you'll be happy to know that there's also support for Garmin's VIRB action camera and LiveTrack. Your data, as always, will live on Garmin's Connect app platform. While it now packs in a heart rate sensor, the Vivomove HR still feels angled more towards the all-day wellness category than harder fitness workouts, making use of 24/7 HR tracking for a more wholesome picture of your overall fitness. I was also able to see my pace for my runs in the app, but note that there's no built-in GPS here. To me it's a bit of a shame as we've seen Garmin manage to squeeze it into the Vivosport, but I also appreciate that cramming that in as well as the display might not have been doable. This omission won't be a deal breaker for many, but when Garmin doesn't let you tether this from your phone, it does limit the Vivomove HR's capabilities as a running watch. It tracks distance using accelerometer data and its own algorithms, but these are never going to be as good as using GPS. Sure enough in testing it was a little off. Nothing crazy, but if you want something that meticulously tracks distance, this is not it. You've also got strength training, letting you count reps for upper body and weight workouts, as well as elliptical workouts – nice extras for gym goers. The strength training mode doesn't account for everything, but we've still found it to be pretty comprehensive. Sleep tracking is about what I've experienced on Garmin's other devices, and I assume it's exactly the same tech working inside. Garmin's sleep tracking does use heart rate tracking to detect sleep (a correction here: we previously stated it wasn't using that info), however it doesn't leverage it to offer the same level of insight that Fitbit's tracking does, though it is getting better. Where Garmin's sleep tracking tech tends to get it wrong with me is my wake-up time, often telling me I woke up a bit later than I actually did. This seems to be especially the case when I wake up but don't get out of bed for a while, and it thinks I'm still asleep when I'm really checking my phone or trying to grab an extra 10 minutes of snooze time. Overall, it's fine, but I wouldn't read too much into the graphs of light and deep sleep, and don't expect consistent accuracy. Garmin claims you'll get about five days of battery life on the Vivomove HR, which is a little less than we were expecting when this was first revealed. A lot of hybrids run longer – some up to years – but with the Vivomove HR you're paying for that screen in battery juice. For the sake of the review I've been using the watch more intensely than you probably will, but I've still been getting four to five days. You can stretch that battery out to two weeks when just in watch mode, however, so you have fair warning before you end up with a dead weight on your wrist. Garmin carefully treads the line between fitness tracker and stylish timepiece, and the results are mostly good. The hidden screen is a useful and unique addition, even if it's not great for handling notifications and suffers in sunlight. Serious athletes will still want to look to the Forerunner and Fenix lines, but as far as hybrids go, Garmin has definitely raised the bar. My only critique is the to small screen. It would be better if the bottom half was all-screen. Battery life is okay, i got 7 days of normal use (without workout) until the 10%-notification showed up. I only enabled Whatsapp and Calls. Is the pointer clear enough in low light? Incoming calls notification works on this smartwatch? i mea, it vibrates during a call? Has anyone used this with the new Pixel 3? When i try to answer calls, it answers using the call screening.